As expected, it's Chiba/Naeko stuff. On the bright side it's maybe Chiba/Naeko stuff for the last time...? No surprises. We'd all predicted that it'd be Chiba x Naeko. Insofar there doesn't seem to be a connection with the previous case, makes you wonder if we'll get one at all or it's postponed until the next one. We have no "incident" insofar from the pics but there'll probably be some big deal at some point. Welp, nobody ever accused DC of being able to pass the Bechdel Test. If Chiba actually thinks Naeko looks like a middle-schooler (roughly ages 12-15) then that right there is the death knell for any prospects of them being in a relationship. I'm not usually this negative with characters but this just irks me so much. As I can hardly imagine them making this up just like that, I guess we might be looking at the official schedule for the following weeks. 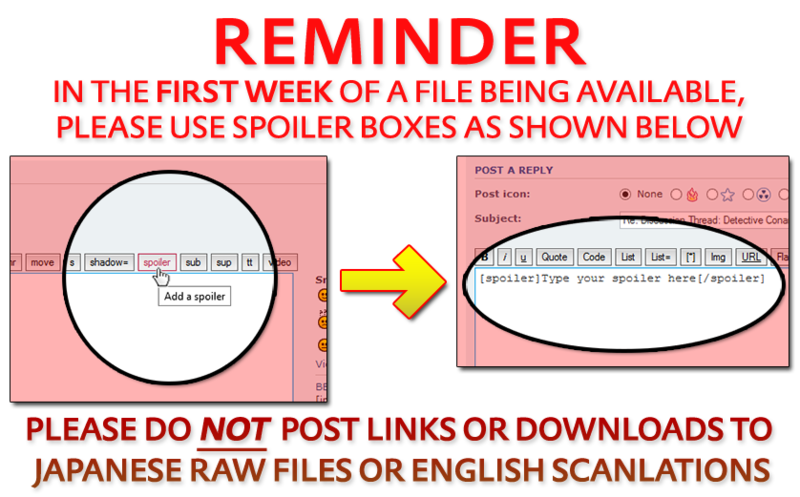 While the absence of File 1017 is certainly peculiar, the numbering suggests that it will be out on July 4. Altogether, this program would be in line with the “long series” that has been promised, and the current case would occupy seven weeks. That or they made assumptions. Websites like these tend to you know. The targets are police officers?! The Metropolitan Police Department trembles— Chapter 2 of the new series!!!! Side note: Happily going to school while following the rules! Yumi: How well-behaved you all are, crossing the street with your arms raised! DB: Yesterday we learned about traffic rules from Naeko-san, so afterwards we researched a lot about them! DB: Children are small and hard to see so they should raise their arm, right? Yumi: Oh? Miike tought you…? DB: Japan’s traffic signs are inspired by England’s, right? Yumi: Did you know that, Miike… ? Operator: We received a report that the corpse of a woman that was beaten to death has been found in Beika East Park! Yumi: We should get to the crime scene and secure it! Naeko: R-right, we need to keep away the onlookers and everything. Mitsuhiko: We still have time before the first lesson, don't we? Genta: Should we go too? Ayumi: Let's go, let's go! 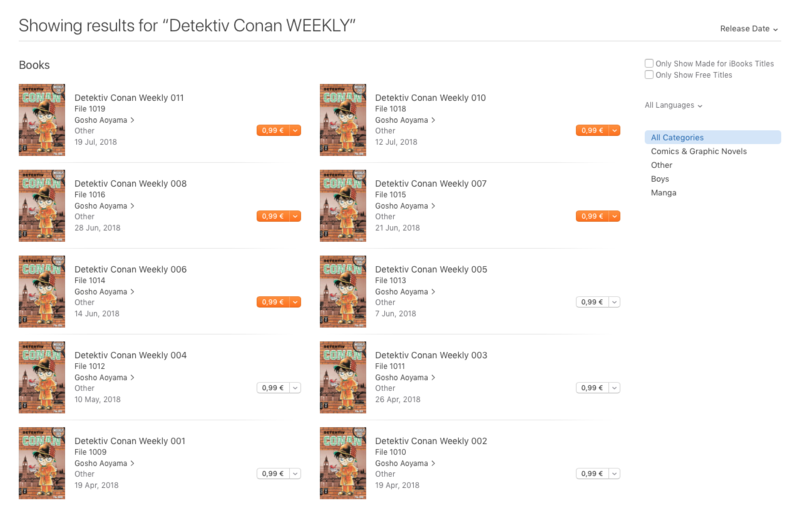 Conan: We'll only take a quick look, understood? Yumi: Speaking of which... you said something about going out for karaoke with Momosaki-san and a few others last night, no? Takagi: But that's right around the corner! Takagi: Is this the act of someone with a grudge against money...? Conan: That's not the only clue! Conan: The middle, ring and little fingers have scratches on the first joint! Conan: And it moved towards her lower body, causing scratches like that. Don't you think? Satou: In order to tell us something? Satou: But where on earth? Conan: Look at the finger tip! Conan: There's a bit of blood on it, right? Conan: There's still a mark where the bloody finger touched! Satou: What does tht mean? Takagi: More importantly, what are you guys doing here? Yagi: Let me through! I am also a police officer! Takagi: Then why did she come to this park? Satou: Is there anyone who had a grudge against her? Satou: Then do swings mean anything to you? Satou: Did you think of something? Yumi: It's your day off today... So please go home and rest! Yumi: Apparently they went to school together! Yumi: That's their old classmate Yumiko! Naeko: O-oh, is that so...? Satou: More importantly, do you really have no idea who might have resented Sergeant Momosaki? Yumi: Who kept complaining incessantly! Satou: When was that? Where did the offences happen? Yumi: It was a week ago, and all three offences took place at an intersection in Beika's 5th disctrict, I believe? Conan (thoughts): If it's the 5th district it should be right next to the Mouri Detective Agency! Satou: Do you remember those three people? Naeko: I took down the names as well! Naeko: The first one was Aono Kengo-san, who was fiddling with his smartphone while driving and also didn’t have his licence on him! Naeko: Who was riding his bike without a helmet and was going in the wrong direction! Naeko: Who hadn’t fastened his seatbelt and was driving a car with an overdue inspection! Naeko: And tried to get away before they could be ticketed, so they had to be forcibly taken in for obstruction of justice! Ayumi: We need to go to school! Yagi: I heard about it from your co-worker! Yagi: You killed Touko, didn’t you?! Operator: Has been found collapsed in a back alley in Haido's 3rd district! Shiratori: That’s close to here, Chiba-kun! Operator: Units stationed nearby and patrols that are in the vicinity are advised to head to the crime scene without delay! Shiratori: What are you doing here? Kuroda: So I decided to attend the crime scene. Side note: These terrifying words that Kuroda threw out... where is this case heading?! 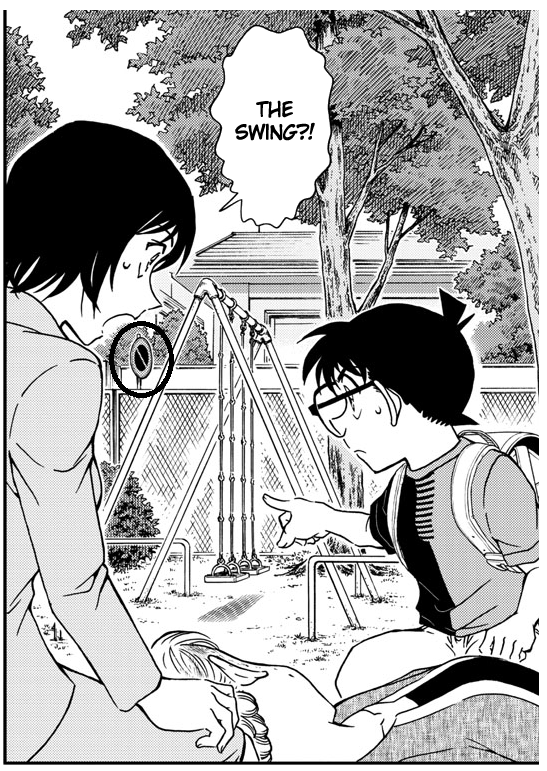 Just my own thoughts, but I think what the first victim was trying to point towards is the sign, which, in this panel, is in the same direction as the swing. I don't know what it means, but, I think Yagi realized it. I think it's Aono Kengo, the guy who was using smart-phone while driving and did not have his driver's license. Amuro mentioned, that he was in hurry because of his girlfriend was neurotic and was waiting for him. ((He was the one, who cried, which is a very honest feeling, exceptionally for a man. It's just a hunch, a first intuition...)) The police woman didn't believe him and they held back because of the incident. "They followed the rules." Here comes the assumption, that the girlfriend got depressed, and became suicide. Aono probably blamed the two police officer and the third one name Yumi(ko), with whom they planned to sing after the interrogation. The first victim (Momosaki) wanted to show the swings, which symbolizes here the mood swing, which is the connection for the (motivation of) murder. Of course, that's rather an indirect clue, but the pieces fits together. The problem is that the second victim (Yagi Shiori). We know thanks to Sato, that Shiori also wanted to show by looking somewhere. But this piece of info is lacking. It's just an another theory, it could be that Max1996 is right. I would like to see the other's opinion. Max1996 wrote: Just my own thoughts, but I think what the first victim was trying to point towards is the sign, which, in this panel, is in the same direction as the swing. I don't know what it means, but, I think Yagi realized it. You can see it there too. It's also pretty prominent in the next chapter when they're by her body, her head seems to be turned in its general direction. I doubt it's a coincidence. Looking up Japanese road signs, that one means "No Parking" which is red and blue. There's a similar sign that means "No Vehicles Allowed," but that has a white background, so the blue stands out to me. To add onto that: the victims all have colors in their names. Aono Kengo, Akamine Manji, and Shiroyama Yuuzou. Blue, Red, White. Coincidence, maybe, but given this is Aoyama I seriously doubt it. Personally, I'm drawn by the background. The blue background seems to be pretty unique to Japanese road signs, and again, it's the only difference from the "no vehicles sign" sign which appeared in Miike's explanation about road signs in 1012. That could hint it's Aono for blue, or else draw attention to Shiroyama, since it has no white. Food for thought at least. Either way, I suspect Miike's explanation about traffic signs was meant to be a hint for the case. I'm going with Aono Kengo. Along with andrasb's point about him crying, he's the only one whose worry didn't involve a third party. Shiroyama's sister had a stalker, and Akamine's ex-wife had an abusive partner. We know from the neighbor in this chapter that a woman committed suicide by jumping off a building. She could have been pushed and murdered, but in that case the killer would logically target the person directly responsible for the death instead of the police who'd stopped him. Also, on the note of Yumi: she's probably unconscious, but I'm pretty sure she chose to lie down on the outline to see where Yagi Shiori was looking before dying. Her pose matches up pretty closely with Yagi's aside from the position of her right hand. ...That said, if he actually kills her off, my respect for Aoyama will skyrocket. Given her relationship with Shuukichi and the subtle hints to the BO plot in this case with Kuroda's presence and Amuro's brief flashback, that would be one hell of a way to kickstart the end-game. The signs at both murder scenes are: It's prohibited to wait here (for a longer period of time). Maybe it is a sign of his hatred that he had to "wait" for the police women which should be prohibited. Just like the sign of the 100 yen which represents the police. the theories about it were quite interesting, appealing and probably right.